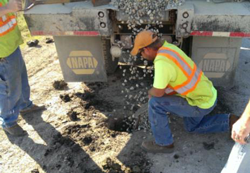 The goals of this project were to implement several stabilization methods for preventing or mitigating freeze-thaw damage to granular surfaced roads and identify the most effective and economical methods for the soil and climate conditions of Iowa. 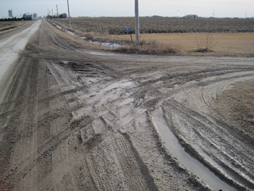 Several methods and technologies identified as potentially suitable for Iowa were selected from an extensive analysis of existing literature provided with Iowa Highway Research Board (IHRB) Project TR-632. 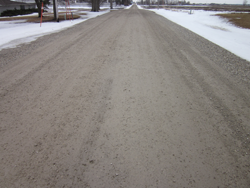 Using the selected methods, demonstration sections were constructed in Hamilton County on a heavily traveled two-mile section of granular surfaced road that required frequent maintenance during previous thawing periods. Construction procedures and costs of the demonstration sections were documented, and subsequent maintenance requirements were tabulated through two seasonal freeze-thaw periods. Extensive laboratory and field tests were performed prior to construction, as well as before and after the two seasonal freeze-thaw periods, to monitor the performance of the demonstration sections. A weather station was installed at the project site and temperature sensors were embedded in the subgrade to monitor ground temperatures up to a depth of 5 ft and determine the duration and depths of ground freezing and thawing. An economic analysis was performed using the documented construction and maintenance costs, and the estimated cumulative costs per square yard were projected over a 20-year timeframe to determine break-even periods relative to the cost of continuing current maintenance practices. Overall, the sections with biaxial geogrid or macadam base courses had the best observed freeze-thaw performance in this study. 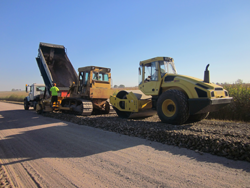 These two stabilization methods have larger initial costs and longer break-even periods than aggregate columns, but counties should also weigh the benefits of improved ride quality and savings that these solutions can provide as excellent foundations for future paving or surface upgrades.